Minister Mason, with Service Alberta Minister Brian Malkinson, announces a $478 million investment in Deerfoot Trail. Deerfoot Trail is the busiest roadway in Alberta with an average of 175,000 vehicles travelling on it every day. The province is adding both northbound and southbound lanes to 21 kilometres of Deerfoot Trail between Beddington Trail and Anderson/Bow Bottom Trail, to improve traffic flow and ease congestion. Multiple interchanges will also be upgraded with additional lanes at Memorial Drive, 17 Avenue, Glenmore Trail, Southland Drive and Anderson/Bow Bottom Trail to reduce commute times at key bottlenecks. Calgarians rely on Deerfoot Trail as the city’s most used north-south vehicle corridor. This major infrastructure project will transform Deerfoot Trail into a modern freeway that meets the current and future needs of a growing, active city. This major expansion builds upon work already underway to optimize traffic flow on Deerfoot Trail. In early 2019, the province issued a Request for Proposals for engineering of a new Intelligent Transportation System to help ease congestion by employing variable speed limit technology and new message boards to alert commuters of expected travel times and incidents ahead. 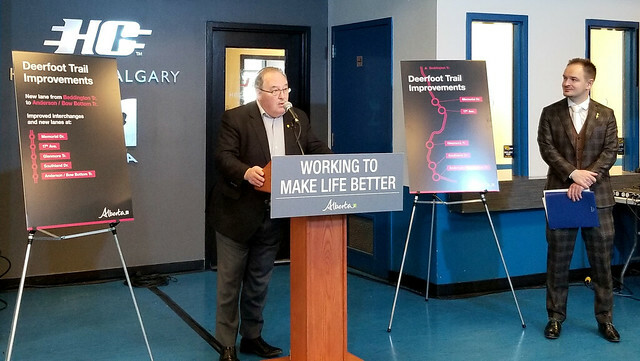 The expansion of Deerfoot Trail is expected to create 2,330 jobs, and $478 million has been allocated in the Capital Plan for the project. In early 2019, the Government of Alberta issued a Request for Proposals for engineering and design work for short-term improvements to Deerfoot Trail. Additional lanes northbound and southbound between Beddington Trail and Anderson/Bow Bottom Trail are required to meet growing traffic demands. Major interchange improvements are required at Memorial Drive, 17 Avenue, Glenmore Trail, Southland Drive and Anderson/Bow Bottom Trail to reduce commute times and improve traffic flow. Deerfoot Trail first opened to the public in 1971. It has been a full freeway since 2005. When the road was built to its present configuration in 2005, Calgary had one million residents. The population of Calgary is now approaching 1.3 million, excluding the rapidly growing populations of Airdrie and Chestermere.